2018 Series information coming soon! And now for something completely different! 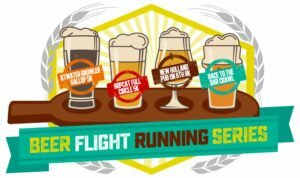 This event is a celebratory event for the last event in the Beer Flight Race Series. We will have five locations around Grand Rapids that athletes will run, walk, or pub-crawl to. If you haven’t done this before, get ready for something amazing, because this isn’t your average race (or your average bar crawl)! The bars included for 2017 are The Knickerbocker by New Holland, City Built Brewing, Garage Bar and Grill, Grand Rapids Brewing Co, and The Grand Woods Lounge. At each location, runners will get a beer and a stamp of completion. Do it for speed, do it for fun, do it for the beer, or do it for all three! There is no set route, although we will give you our recommendation and a “best way” that is marked on the roads. Whether you take our route or not, you will have find your way from bar to bar. Those running just to run are still required to check in at each bar and get their stamp. The drinking at each bar is not required for the race portion and runners can get their stamp and carry on. If you don’t get your beer on the way through the first time, you will have a designated amount of time to go back and drink your beer after the finish. But you must have checked in at each bar in order to be eligible for awards! The only rules are that you must be on foot the whole way, keep your beer in the designated areas, and you obey all traffic laws (the roads won’t be closed like a regular race!). We will have a the start and finish line at the Knickerbocker where you will receive a finisher’s award to complete your Beer Flight Series collection. We will also have awards for the fastest finishers in the Racing, Running and Drinking, and Crawling categories. Why not join us as we sample some of the best beers in Grand Rapids while enjoying a running tour of the town? The race will start and finish at the Knickerbocker by New Holland. Parking will be available in any public parking or street parking in the area. Make sure you leave enough time to park and check in before the Crawl starts! See the Course Maps tab for more details on the bars included in the course. One beer at each bar along the route! Finishers Glass – 4th in the series! Remember, if you do all four races in the series and collect all four glasses you will receive a custom paddle on which to display them! These are the locations of the bars along the course.